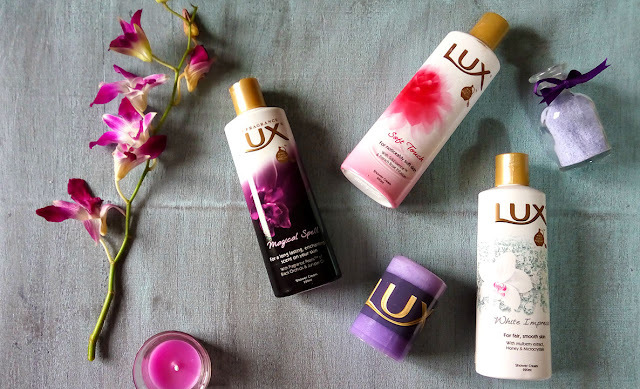 I am not a died hard fan of Lux soaps unless I use them for hand washing but when they sent me the Body washes I was quite eager to give them a chance. I was little late in trying them out because, quite frankly, I forgot where I stashed them till I came across them again a month ago while cleaning my cupboard. It was the right time, hot summers, more showers, even more body washes, yes! I was sent three variants at the time of the launch (which I have forgotten about now, sorry!). 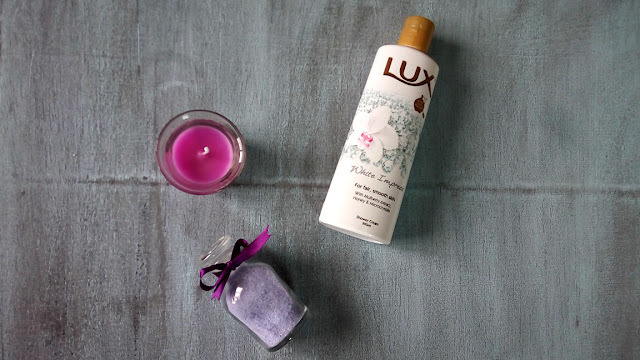 The purple Magical Spell, The reddish pink Soft Touch and the White Impress. The good thing about these body washes is the affordability, retailing at pkr.200 only, along with good, long lasting fragrances. They do a pretty good job, not too drying either. The formulas are quite nourishing actually. The reason I prefer body washes over soaps is because they not only clean but have added value. They moisturize and the scent lasts longer than soaps. The packaging is simple yet pretty at the same time with press and pop open easy to use squeezable plastic bottles. The fragrances for LUX are also developed by the best perfumers in the world. 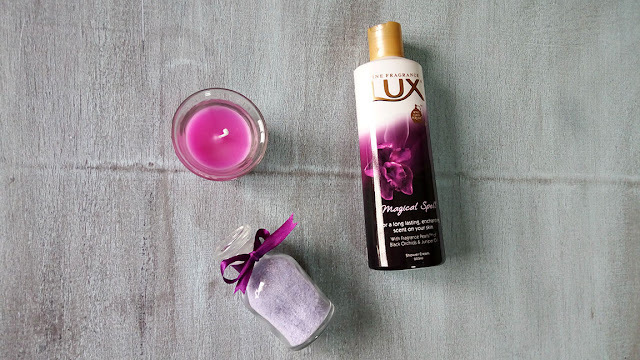 The purple Magical Spell body wash boasts about it long lasting fragrance that should last up to 8 hours. To be honest it did last long but not 8 hours. I don't tend to smell myself after cleaning up, the general good feeling of being fresh and clean is enough. However, the fragrance from this body wash does linger and the feel good lasts longer. The formula is creamy and it lathers up easily too. The rich floral fragrance, I can smell orchids, for this variant was developed by a known Master Perfumer Ann Gottlieb who wanted to make Magical Spell smell exotic. Not as strong in terms of fragrances as Magical Smell but definitely refreshing. The smell is more fruity and playful. I use this more during ordinary days as I am a fruity person my self, hehe. It also makes skin smoother and softer as it contains mulberry extracts along with honey and microcrystals. This was not a favorite. I use it more for a quick shave but never for the entire body wash. I am not a big fan of rose fragrance when it comes to soap or body washes. It gets a but mundane as every soaps smells similar to me. I was not able to understand this fragrance which just seemed like liquefied lux bar to me. It actually reminded me of a certain hair removal cream when I first smelled it. ALL three body washes are available in most big stores across Pakistan and retails at PKR.200 for a 200ml bottle. You can also buy online from Daraz.pk.